If you don’t think parking lot maintenance in Austin is an important investment, think again! Can you imagine any paved surface that gets more wear and tear than a parking lot? The sheer weight of the vehicles alone would be enough to wear down even the finest quality asphalt. But when you combine that with exposure to weather, fluids from vehicles and water seeping in from surrounding landscaping, it’s no wonder that so many Austin parking lots look worn out and old. And, since your parking lot is the first thing that most people notice, a damaged parking lot can truly be a poor reflection on your business or rental property. Fortunately, asphalt is an extremely strong and resilient material. Made from a combination of sand, tar, rock and bitumen, asphalt is the preferred material for everything from parking lots to major thoroughfares. The rock and sand in asphalt make it strong, and the tar and bitumen make it flexible. But even a surface as strong as asphalt will weaken over time, and that usually means cracks, pot holes and depressions in the surface. When you start noticing damage in your parking lot, it’s important to have it repaired as quickly as possible. Chances are the damaged areas will become worse in a hurry, and what could have been a minor repair job can easily turn into a major expense. That’s why a little preventive parking lot maintenance is so important. It can help address those issues before the damage ever happens. Seal coating acts as a barrier that protects the asphalt surface from damage caused by gas, oil and other fluids from vehicles. It also helps to prevent oxidation and weather-related damage to the surface. Bennett’s trained experts will first make any needed repairs to your parking lot before applying the seal coating. How often you have seal coating applied depends on the level of use of your parking lot and your local weather conditions. Because we’re local contractors, the experts at Bennett Paving know all about Central Texas weather. We can suggest a regular schedule of seal coating that is most appropriate for your parking lot maintenance in Austin. Another regular part of parking lot maintenance that we recommend is parking lot striping. You would be amazed at what a difference a fresh coat of paint makes! Even an older parking lot, or one surrounded by dated buildings, can look new again with fresh striping. So now that you know the importance of parking lot maintenance, the next step is finding the right contractor to handle the job for you. Fortunately, you don’t have to look far! The experienced, local professionals at Bennett Paving Inc. can handle whatever form of parking lot maintenance you need done. From seal coating to minor repairs to striping and more, our experts understand what it takes to get your parking lot looking like new again in no time. And our expertise isn’t all we have to offer. We also understand how important it is to stay on budget and finish the job on time. We promise you that we’ll do everything possible to accomplish both of those goals. 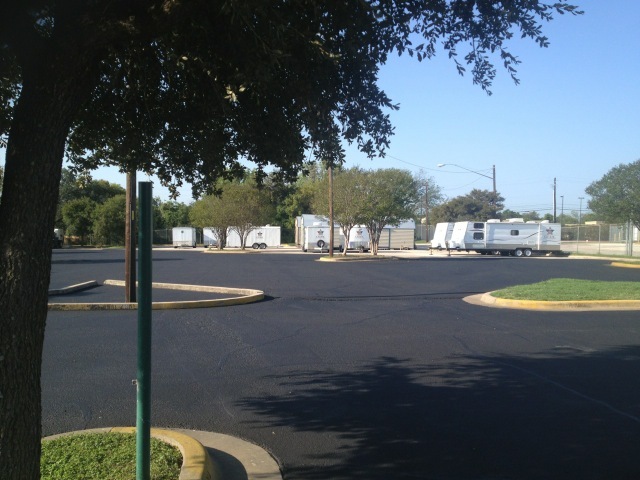 If your Austin parking lot needs some maintenance, call us today for a free quote.